In December of last year, Dan and I were sitting on the couch when he mentioned that he would like to take a trip. I thought, "YES, he finally wants to take me to Costa Rica!!". He then went on to say that he wanted to take his Ducati up to Alaska. While this wasn't exactly the vacation that I had in mind, this adventure seemed super cool, and I eventually got up the nerve to ask if I could come along. Dan agreed, and then made it his personal mission to make this the trip of a lifetime for both of us. He spent countless hours researching ride reports, reading forums, researching routes, and outfitting his motorcycle with all the necessary gear. He also made sure that I was going to be as safe and comfortable on this trip as possible...I can't wait to show y'all my stylish riding gear! So, after months of preparation and anticipation, the final countdown has begun! Yesterday I washed all the dirty laundry that Dan told y'all about and started the packing process. Those of you that know me, know that I don't understand the idea of "packing light". I like lots of options...cloths, shoes, jewelry, bags...you get the idea. So when Dan showed me the bag that I would be allowed to pack in for 18 days, I thought he was joking. Somehow, I managed to make it work...I just pray that we find some laundry services along the way. Dan wears the same t-shirts and pants every single day, so the small packing space didn't phase him. 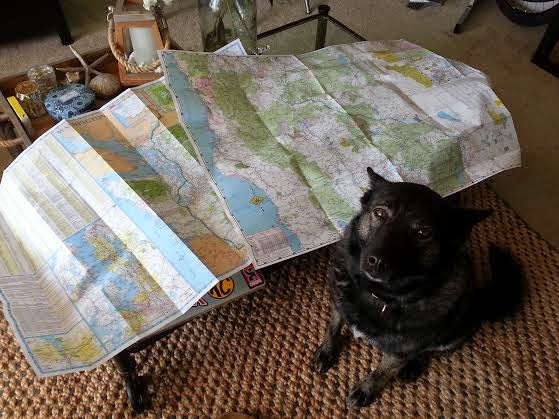 Sadie is helping Dan map out our route! Here's Dan with his Alaskan wardrobe! Sadie is nice and warm, but we still haven't figured out how to safely attach her side-car to the motorcycle, so she will have to stay in California with her auntie Sarah and grandma Shelley. Dan's sister Sarah will watch over our precious Sadie for the first week, and then his mama Shelley will fly out to stay with her until I return home from Fairbanks! These ladies are THE BEST! 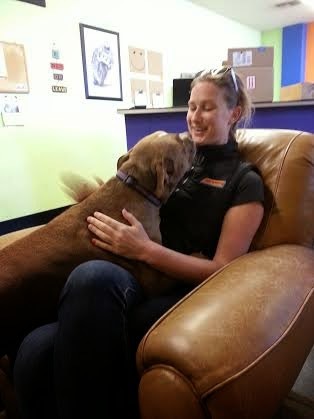 We couldn't have planned this trip without knowing that Sadie would be taken care of by Sarah and Shelley! Thankfully, Dan has decided to pack more than one pair of underwear...and lots of wet wipes! Here is everything all rolled up in nifty air tight/water tight bags! Here it is! Our clothing allowance for 18 and 36 days, all packed tight into the vacuum bags that will fit into the side cases of the motorcycle! This is a personal victory for myself! 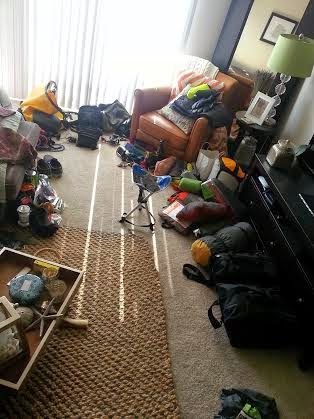 Here is all of our camping gear. Tent, two sleeping bags, two sleeping pads, two camping pillows, and two little camping chairs. Most of this gear will go into a Wolfman dry-bag, and get strapped to the back of Rick's motorcycle after being shipped to Seattle. Here is a little preview of more camping supplies...and LOTS of mosquito repellant! And last, but not least, the electronics that will tag along on this adventure! As I write this entry, we are waiting in the lobby of Evolution Suspension as the Ducati gets a new 900 pound rear spring strong enough to accommodate two people over 6 feet tall and all this gear! This is the Evolution mascot...appropriately named, Mallory! Mallory has some pretty gnarly gas! Eventually this will all fit onto the Ducati...we hope. Tonight I will work my last shift at work before we depart on our long-awaited Alaskan adventure. I can't believe that it is finally here!! Dan will work one more shift on Thursday night, and then we will spend all day Friday packing, repacking, and repacking again! In three days we will put on our fancy riding gear, plant our asses on our fancy seat cushions, kiss Sadie goodbye, and wave farewell to San Francisco as we make our way to Lake Tahoe to spend a couple of days with my parents! I would be lying if I said that I haven't been nervous about the long hours and thousands of miles that I am about to spend on the back of this motorcycle, but my excitement totally outweighs my fear, and I am SO excited for this journey to being! T-minus 3 days.....!!!! !